NON-DESTRUCTIVE OPTICAL CHARACTERIZATION TOOLS: Spectral Interferometry Using Minimum-phase Functions. Dr. Waheb Bishara of our group has received the 2011 Chancellors Award for Postdoctoral Research. This is an award that is given to 5 postdoctoral scholars across UCLA. Congrats Waheb!! 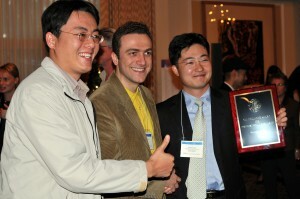 Prof. Ozcan received the 2011 SPIE Early Career Achievement Award. 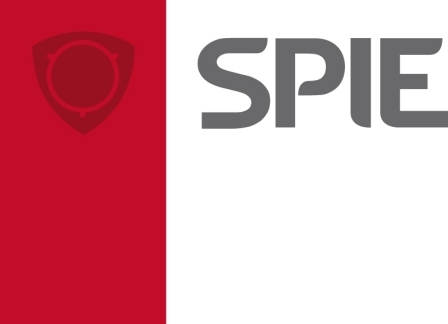 SPIE: SPIE is the international society for optics and photonics, and SPIE Early Career Achievement Award is given annually to an early career professional in recognition of significant and innovative technical contributions to any of the engineering or scientific fields of interest to SPIE. Prof. Ozcan has been selected as one of the top 10 innovators by USAID, NASA, NIKE, Inc. and the U.S. Department of State. The selected innovators will participate in the LAUNCH: Health Forum at NASA’s Kennedy Space Center in Florida October 30-31, followed immediately by the launch of the Space Shuttle Discovery on November 1. LUCAS from SecondMuse on Vimeo. Prof. Ozcan has received the Popular Mechanics Breakthrough Award. 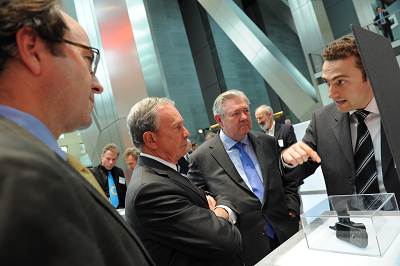 NY Mayor Mike Bloomberg has received a brief introduction on LUCAS from Prof. Ozcan at the award ceremony. Prof. Ozcan has been named as a PopTech Science and Public Leaders Fellow. 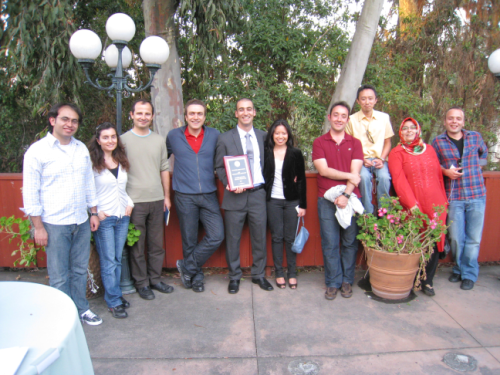 Prof. Ozcan has received the USC Body Computing Slam Prize. The competition took place the evening of September 23rd, the night before the Body Computing Conference 4.0 at USC. 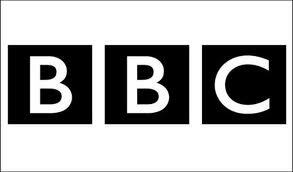 BBC reports on our group’s telemedicine work. 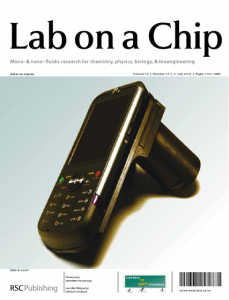 Our lensfree cellphone microscopy work has been selected as the cover article of Lab on a Chip. Lab on a Chip: Microfluidic & nanofluidic technologies for chemistry, physics, biology, and bioengineering. Prof. Ozcan has received the 2010 NSF CAREER Award. NSF CAREER Award: The Faculty Early Career Development (CAREER) Program is a Foundation-wide activity that offers the National Science Foundation’s most prestigious awards in support of junior faculty who exemplify the role of teacher-scholars through outstanding research, excellent education and the integration of education and research within the context of the mission of their organizations. Prof. Ozcan receives the 2010 National Geographic Emerging Explorer Award. 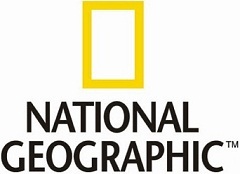 National Geographic: National Geographic’s Emerging Explorers Program recognizes and supports uniquely gifted and inspiring young adventurers, scientists, photographers, and storytellers—explorers who are already making a difference early in their careers. Ozcan Research Group wins the Grand Challenges Explorations Award from the Bill & Melinda Gates Foundation. Bill & Melinda Gates Foundation: The Bill & Melinda Gates Foundation is dedicated to bringing innovations in health and learning to the global community. Grand Challenges in Global Health. 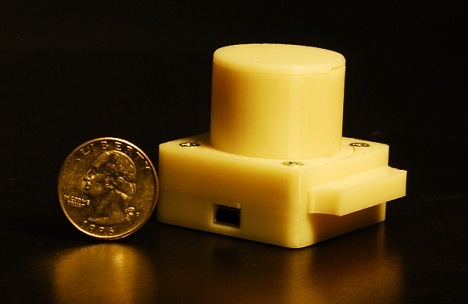 ScienceDaily, mHealth Update and others report on our lensfree telemedicine microscope. 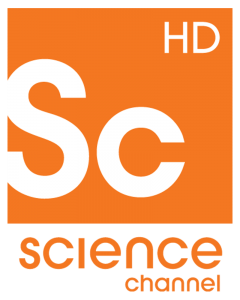 ScienceDaily: ScienceDaily is one of the Internet’s most popular science news web sites. mHealth: A blog dedicated to bringing together the latest news and developments in the area of mobile health..
PhysOrg: PhysOrg.com is a leading web-based science, research and technology news service which covers a full range of topics. Our LUCAS technology has received an international award from France, and Prof. Ozcan will be receiving the Netexplarateur Award in early February with a ceremony at the French Senate in Paris. Award Description: Netexplorateur is an Observatory of new digital practices that gives out 10 awards annually, under the aegis of the offices of the Secretary of State for Strategic Studies and the Development of the Digital Economy and the French Senate. More information about this award. 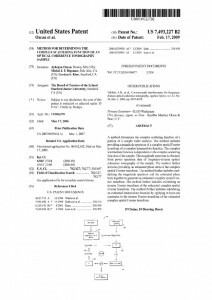 Prof. Ozcan’s 16th patent has been issued. Patent Description: Optical image processing and femtosecond spectroscopy using minimum-phase functions. The New York Times reports on LUCAS and its adaptation to a cellphone. Article Title: Far From a Lab? 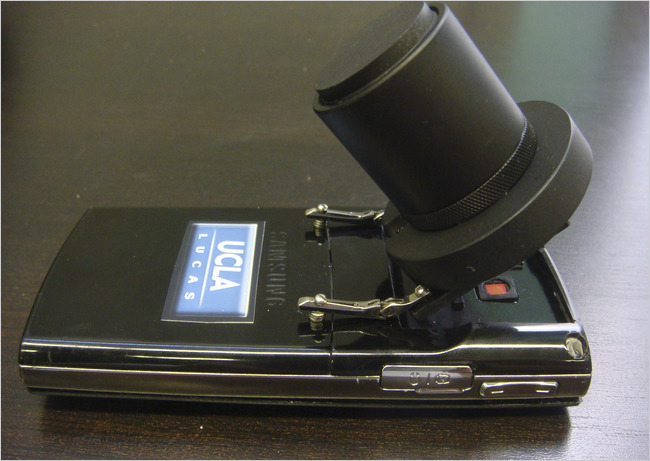 Turn a Cellphone Into a Microscope. Article Description: “We convert cellphones into devices that diagnose diseases,” says Aydogan Ozcan, an assistant professor of electrical engineering at U.C.L.A. Publish Date: November 7, 2009. Prof. Ozcan receives the NIH Director’s New Innovator Award. Awards Name: 2009 NIH Director’s New Innovator Award. Awards Description: The NIH Director’s New Innovator Award addresses two important goals: stimulating highly innovative research and supporting promising new investigators. Prof. Ozcan receives MIT’s TR35 Award. Awards Name: 2009 MIT’s TR35 Award. Awards Description: Technology Review have honored the young innovators whose inventions and research we find most exciting; The collection is the TR35, a list of technologists and scientists, all under the age of 35. Prof. Ozcan has been named as the General Co-Chair of IEEE Photonics Society Topical Meeting on Advanced Imaging in BioPhotonics. Meeting Description: The Topical Meeting Series of the Photonics Society is the premier conference for emerging fields in photonic science, device technologies, and applications. 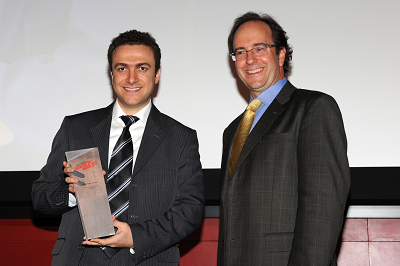 The Ozcan Group wins the 2009 Wireless Innovation Project of Vodafone Americas Foundation. Awards Name: 2009 Wireless Innovation Project of Vodafone Americas Foundation. Awards Description: The Vodafone Americas Foundation designed the Wireless Innovation Project as a competition to promote innovation and increase implementation of wireless related technology for a better world. Prof. Ozcan gives an interview on Earth & Sky Radio Series on LUCAS. Association Name: Earth & Sky. 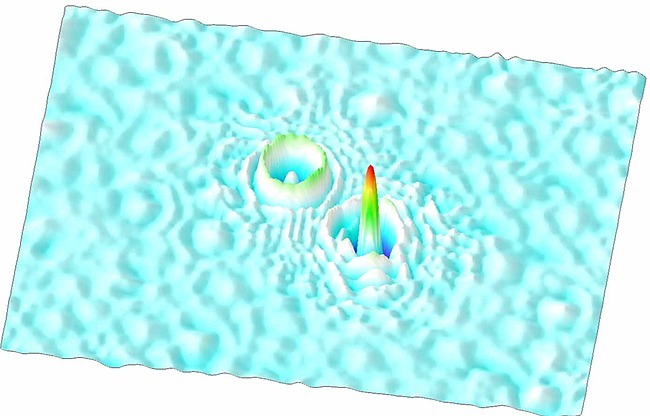 Interview Content: Prof. Ozcan describes his group’s effort and explains LUCAS. Prof. Ozcan receives the 2009 ONR Young Investigator Award. Awards Name: 2009 ONR Young Investigator Award. Awards Description: 15 awards were made out of a pool of >190 applicants. Prof. Ozcans 15th patent has been issued. Patent Description: A new optical coherence tomography set-up and data processing to achieve better resolution. The inventors of LUCAS and FrontlineSMS:Medic are now partnering to bring their technologies together to provide solutions to several global health related problems in the developing world. This exciting joint effort will be lead by Prof. Ozcan and Ken Banks of FrontlineSMS. Anthony Erlinger of the LUCAS team wins the Best Poster Award at the California Alliance for Minority Participation Symposium at UC Irvine. Congrads Anthony We are not surprised!! Another honor for the Ozcan Group: Dr. Seo of the LUCAS team has received the 2009 Chancellors Award for Postdoctoral Research. Awards Description: This award will provide a prize of $4,000 each to especially accomplished UCLA postdoctoral scholars recognized for their outstanding research. CNN and CBS Science Channel independently report on LUCAS. Association Name: CBS Science Channel. 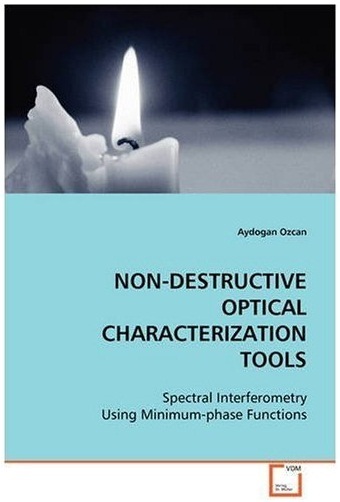 Prof Ozcan’s book on non-destructive optical characterization tools is now available in all major stores including Amazon and Barnes & Noble. Prof. Ozcan receives the 2009 IEEE Photonics Society (LEOS) Young Investigator Award. Awards name: 2009 IEEE Photonics Society (LEOS) Young Investigator Award. Awards Description: The Young Investigator Award was established to honor an individual who has made outstanding technical contributions to photonics (broadly defined) prior to his or her 35th birthday. 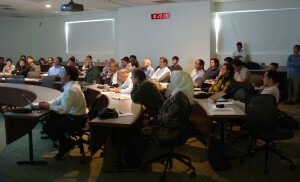 Prof. Ozcan organized the first BioPhotonics Workshop at UCLA. A new tool for TeleMedicine: Lensfree On-Chip Imaging for High-throughput Cytometry and Point-of-care Diagnotics. Our Group’s work on LUCAS appears at the cover of IEEE LEOS Newsletter, October Issue. LEOS Newsletter is published bimonthly by the Lasers and Electro-Optics Society of the Institute of Electrical and Electronics Engineers, Inc., Corporate. Our undergraduate student, Anthony Erlinger, of the LUCAS team wins a prestigious fellowship. Scholarship Description: The CARE Fellows Program provides students with little or no previous research experience the opportunity to receive financial support while participating in a research project with a faculty mentor. Prof. Ozcan gives an invited lecture at Lehigh University’s Advanced BioPhotonics Imaging Technologies Workshop. A New Tool for TeleMedicine: Lens-Free On-Chip Imaging for High-Throughput Cytometry and Point-of-Care Diagnostics Aydogan Ozcan, UCLA. Prof. Ozcan joins the Scientific Advisory Board of the Lifeboat Foundation. Lifeboat Foundation: The Lifeboat Foundation is a nonprofit nongovernmental organization dedicated to encouraging scientific advancements while helping humanity survive existential risks and possible misuse of increasingly powerful technologies, including genetic engineering, nanotechnology, and robotics/AI, as we move towards the Singularity. Scientific Advisory Board of Lifeboat Foundation. The Ozcan Group receives an Outstanding Paper Award in the Annual Fall Meeting of BMES. Congratulations to the co-authors of this work! MIT’s Technology Review Magazine highlights our on-chip cytometry work on LUCAS. Artical name: Counting Cells in Seconds. Artical description: A lensless imaging system finds and recognizes the shadows of T cells and bacteria. Prof. Ozcan had an interview with Ozge Ovun from Voice of America News. Voice of America: The Voice of America is one of the world’s most trusted sources for news and information from the United States and around the world. Prof. Ozcan is organizing a BioPhotonics Workshop at UCLA Electrical Engineering Department on October 24th. Please see the flyer for the details. RSVP is required. Prof. Ozcan wins an NIH R21 award on nano-plasmonics. Association name: National Institutes of Health. Mission: NIH is the steward of medical and behavioral research for the Nation. Its mission is science in pursuit of fundamental knowledge about the nature and behavior of living systems and the application of that knowledge to extend healthy life and reduce the burdens of illness and disability. Our cytometry technique LUCAS is now in the news. Check it out in UCLA Newsroom. For more links refer to our Research Interests. Congratulations to Anthony Erlinger as he received the 3rd place in UCLAs RISE-UP poster competition. Competition name: RISE-UP poster competition. Prof. Ozcan is one of the recipients of the 2008 Okawa Foundation Research Awards. Awards name: 2008 Okawa Foundation Research Awards. Awards description: The Okawa Foundation for Information and Telecommunications was an authorized nonprofit organization to promote the growth and development of the information and telecommunications fields. Bahar and Justin pass their PhD preliminary exam with an outstanding success qualifying for a departmental fellowship. The University Written Qualifying Examination is known as the Ph.D. Preliminary Examination in The Henry Samueli School of Engineering and Applied Science. Ph.D. students in Electrical Engineering are required to successfully complete a Ph.D. Preliminary Examination in order to progress into their Ph.D. studies. Prof. Ozcan wins an NSF award on Biophotonics for Human Health. Awards name: National Science Foundation Awards. Awards description: The NSF funds research and education in science and engineering, through grants, contracts, and cooperative agreements. The Foundation accounts for about 20 percent of federal support to academic institutions for basic research. Prof. Ozcan’s proposal together with Prof. Bahram Jalali has been selected to represent UCLA for NSF MRI opportunity on high-resolution near-field spectroscopy. The Major Research Instrumentation Program (MRI) serves to increase access to shared scientific and engineering instruments for research and research training in our Nation’s institutions of higher education, museums and science centers, and not-for-profit organizations. Prof. Ozcan’s proposal together with Profs. Diana Huffaker and Bahram Jalali has been selected to represent UCLA for Keck Foundation Phase I submission on mid-infrared imaging and spectroscopy. The W.M. Keck Foundation was established in 1954 in Los Angeles by William Myron Keck, founder of The Superior Oil Company. Our Foundation is one of the nation’s largest philanthropic organizations, with assets of more than $1 billion.